I watched a movie the other night about the hunt for Osama Bin Laden. It was a hard movie to watch, mainly because all I could think about was the evil that humans are capable of. We, humans, can do so much good, but we can cause so much pain and so much hurt. I began to question God, “How could there be so many people with so much hate in their heart? How do we ever stop this?” I thought of how cold and hard the hearts of terrorists must be and I began to get a little scared. But God quickly reminded me that He can change even the hardest of hearts. He loved Osama Bin Laden. Woah. Jesus died for Osama Bin Laden and he needed Jesus just as much as we need Jesus. The next day, I watched with the rest of America as a young American man came home after being detained in North Korea for over a year. I read comment after comment about how terrible Kim Jong-un is and the wretched conditions in North Korea. My heart grew increasingly heavy and I began to wonder, once again, what hope there could be in a man like Kim Jong-un ever coming to know the Lord. The Lord quietly spoke to me, “Remember, Kendra? I can soften the hardest of hearts.” And peace flooded into my spirit. and He has changed incredibly broken people. 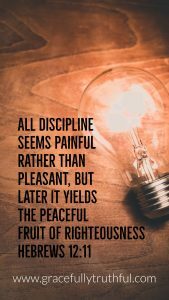 Paul was born as Saul and was a Jewish man, born in the large city of Tarsus, who studied the Old Testament profusely and cared deeply about upholding Jewish traditions. He was a Pharisee. He was an angry and bitter Pharisee. He hated that other Jews were choosing to follow Jesus, leaving behind treasured traditions, sacred scripture, and Jewish law. He hated that these Jews-turned-Christians were mingling with Gentiles (non-Jews) and were practicing idolatry with these new friends. It wasn’t right! It wasn’t fair! He had devoted himself to two things: his trade of tent-making, and his religion. These people were walking away from Jewish traditions for some “lowly man” whom they claimed God favored enough to raise from the dead?! Preposterous! The hatred Saul held in his heart for these traitors, led him to become one of the loudest voices in encouraging the persecution of the Christian Church. He spent his days traveling from town to town declaring that disobedient members of the synagogues should be disciplined through ostracism or flogging or imprisonment or death. It would take something huge to change his heart of stone. But something huge did happen. God called Saul, changed his name to Paul, and used other believers to minister to and disciple Paul. 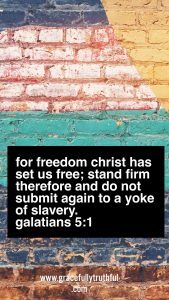 In Galatians 1:11-24, Paul quickly shares his testimony… he once was a man who persecuted Christians, but because of God’s great grace, Paul was now preaching to Christians. The Good News of Jesus Christ was so compelling that he was transformed from persecutor to preacher. Paul was transformed! See, God has transformed the hearts of people who are stuck in their religion and traditions. 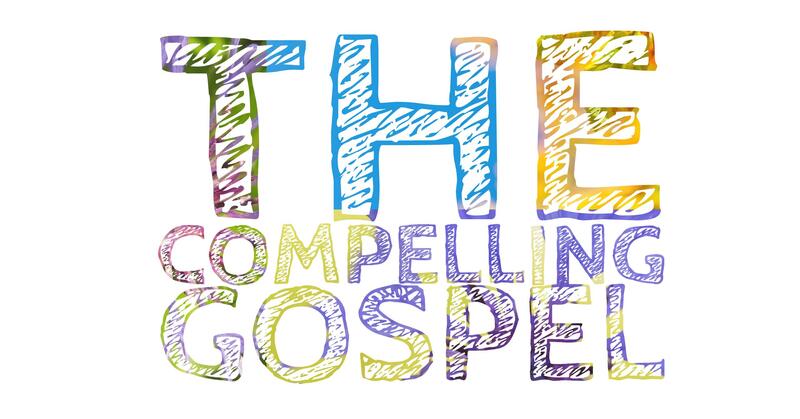 The gospel is transforming. It is powerful! and now He LIVES, is POWERFUL! It melts the hardest of hearts and the coldest of souls. 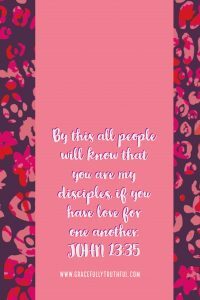 And if we have seen the gospel change Paul’s life, if we have seen how the Truth was so compelling, Paul HAD to share the Good News, shouldn’t we want to share, too? just like Paul was… just as we have been? Pray for the people in your life who feel like they will never change. or who comment negatively on any social media post about Jesus. Pray with me for those who are so stuck in their religion and traditions that they refuse to believe that all they need is Jesus. And pray with me for the people who we often refuse to believe could ever change… dictators, political leaders, terrorists… the people a lot of us forget to pray for. We should never stop praying for people who don’t know Jesus because the Gospel is so compelling that we must pray and we must tell others about Jesus. 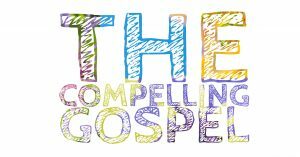 Because the Gospel is so compelling, people will be changed and they will be saved! Thanks for joining us today as we journeyed into Freedom Week One! Don’t miss out on the discussion below – we’d love to hear your thoughts! My mind tends to work like a puzzle. I hear a little bit of something over here, and I learn a little bit from over there, and I read something at the doctor’s office and suddenly… an “Aha!” moment has occurred and every piece fits into place. I typically don’t “get” things instantly. I distinctly remember sitting in a science class one day and it was as if everything I’d learned that semester was slowly being put together and all of a sudden, I could see the whole picture. The first communion is often known as “The Last Supper”, when Jesus and His disciples were gathered together to celebrate the Passover right before His crucifixion. In this incredible moment, Old and New Testaments collided in one epic evening. First we go back, way back…to when the Israelites were slaves in Egypt. Through Moses, the Lord told the Israelites to sacrifice a perfect lamb and smear his blood on their door frame because the angel of death would soon “pass” “over” (hence, “passover”). Whoever was not covered by Lamb’s blood, their firstborn son would be dead by morning. This was the final plague that drove Pharaoh to release the Israelites into freedom. As a reminder of this freedom, “Passover” was to be celebrated every year. Fast-forward to the night before Christ’s death… and we find Jesus celebrating the Passover with His disciples. While they were eating, Jesus took bread and blessed it before telling His disciples, “Take, eat; this is my body.” He then took a cup and told the disciples to drink, “…for this is my blood of the covenant, which is poured out for many for the forgiveness of sins.” He was foretelling what was to come later that night. You see, Jesus became the sacrificial lamb that both Hebrews and Egyptians had to use to cover their doorframe to save their sons. 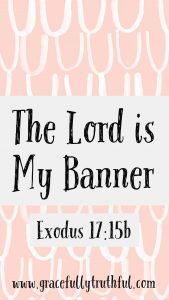 As you read in Exodus, it wasn’t just any lamb the Israelites were called to use, it was a perfect and spotless, male lamb. Jesus is the perfect sacrificial lamb. His blood covers us, just as the lamb’s blood covered the door frame, and we don’t have to worry about spiritual death because of His victory over death! We celebrate and remember His sacrifice as a Church – His bride, by taking communion together. The bread is a symbol and representation of Jesus’ body. The wine (or grape juice), a symbol of His blood that was spilled. When we take Communion, it’s to remember the great sacrifice Jesus made to save us! So what do Communion and marriage have in common? This is the part that just gets to me. It is so incredibly amazing that the Lord put this much detail into His relationship with us and the relationship between a husband and wife! The literal definition of communion is: “the service of Christian worship at which bread and wine are consecrated and shared.” When we take the bread and drink the wine, and remember the great sacrifice of Jesus, we are remembering that because of Him, we are His bride. There is so much about this that we could study, but for now, I’m going to point you to a study Mike Bickle has done on how the Church is Christ’s bride, for more on this. The act of consummating our marriage (devoting ourselves to a holy relationship with our spouse), is a representation of taking communion (remembering and devoting ourselves to a relationship with Jesus). God created marriage as a physical example of what He wants His relationship with us to look like! Husbands are commanded to love their wives just as Christ loves the church! That is why our marriages are so incredibly sacred. Not only because we’ve taken a vow before God to choose love over our own feelings, but because marriage was designed to imitate the Lord’s great love for us. God would never leave us. He would never forsake us. He chooses to love us despite the fact that we often forget to spend time with Him. We put other things and people above Him, but He never stops loving us! The Old Testament beautifully points towards Jesus being our Bridegroom, our heart’s true soulmate. Song of Songs poetically describes the incredible love between a groom and his bride. In Hosea, God calls a man to marry an adulterous woman to visibly depict His boundless love for us as His own bride, even though we stray often from His love. Can only Christians take Communion? If someone doesn’t know Jesus, if they don’t know why they even need to be covered by His blood, then there is no point in taking communion because there is nothing sacred or special about it for that person. Paul even warns Christians about taking communion without actually stopping to think about why we are taking it. So, yes, only Christ followers are invited into communion. 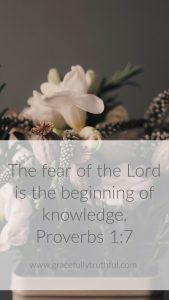 Author and pastor Francis Chan states that if we all just take a few moments before praying and think about who God is, His power and glory, then we can more reverently pray and approach His throne with a holy fear of the Lord. I believe this to be the same about communion. If we pause before communion to remember why we are taking it, then we can more reverently participate in this remembrance and celebration of the wonderful gift God has given us in His Son… the perfect, spotless Lamb. Listen in on this incredible dramatic poem by Hosanna that portrays why we need Jesus’ blood to cover us and how vast His love is for us! 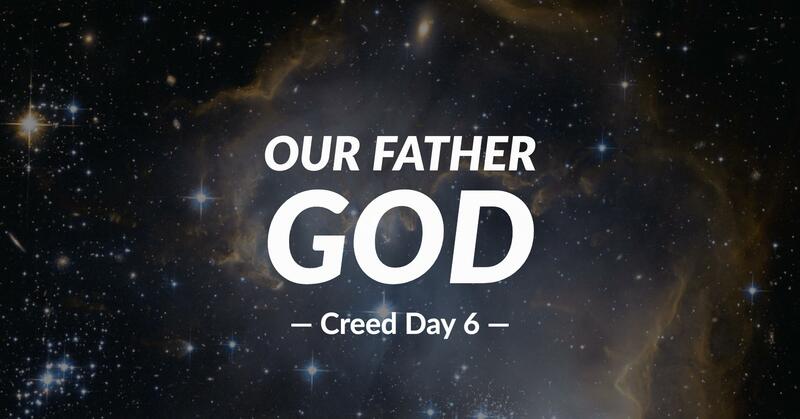 Thanks for joining us today as we journeyed into Creed Week Three! Don’t miss out on the discussion below – we’d love to hear your thoughts! The very first thing I always think of when I hear “salvation”, is the scene from Guys and Dolls when the Salvation Army band marches through the streets to “convert” people. It’s probably the image “salvation” has for many people: high-nosed, goody-goodies parading around trying to get people to hop on the bandwagon. Sometimes they try scaring the hell into people, or by making life with Jesus sound like having a genie in a bottle with never-ending wishes. “Just say The Sinner’s Prayer!”, they chant. But Salvation is SO. MUCH. MORE. God created the earth and everything in it, declaring it perfect until sin. The horrible cancer of sin kept multiplying, infecting everything once it entered the world. The Ten Commandments are God’s standard of righteousness; anything deviating from that standard of perfection, is sin. Ever lied? That makes you a sinner. Ever stolen? Even a pen from work? Not a “mistaker”…a ”sinner”. Though there are ten, you only have to break one of them to be a complete sinner. But, here’s the amazing news! 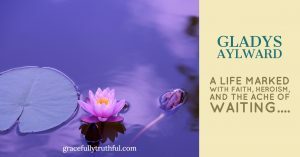 Being fully God and fully human (more about that in another Journey! ), Jesus was the only 100% sinless person to ever walk this earth. He lived out the perfect life for us because we can’t! Along with the Ten Commandments, we can look at Jesus’ life and see just how dirty we are. We can never actually be with God because of our disease. His holiness cannot be stained with a drop of our sin. So here we are, looking nasty and sinful – like a face covered in oozing zits. In order to be with God, we need more than a facelift and some spa treatments, we need a transplant. Jesus gives us His own flawless face! We are still us underneath, but His righteousness is now ours and Sin is no longer our master. His righteousness cleans us from the inside out, so we, on the inside, actually start to look more and more like the face of Christ – perfect, and smooth and completely whitehead-free (we call that sanctification). Now, that’s a pretty interesting way to look at salvation. But it’s true! Salvation is Jesus, taking our nasty sins and saying, “Trade me your sins for my perfection so you can be with God.” That trade was made possible when Jesus – the perfect God-man – died on the cross (a sinner’s death). Salvation becomes our own when we recognize that we are indeed horrible, brown-teethed, acne-faced sinners who need Jesus. When we say yes to His exchange, we are given Salvation! Salvation is a one-and-done deliverance from sin and its eternal consequences, granting us access to a relationship with our Creator. Salvation happens at a single point, when we surrender our hearts to Christ, but its benefits reach into all eternity! 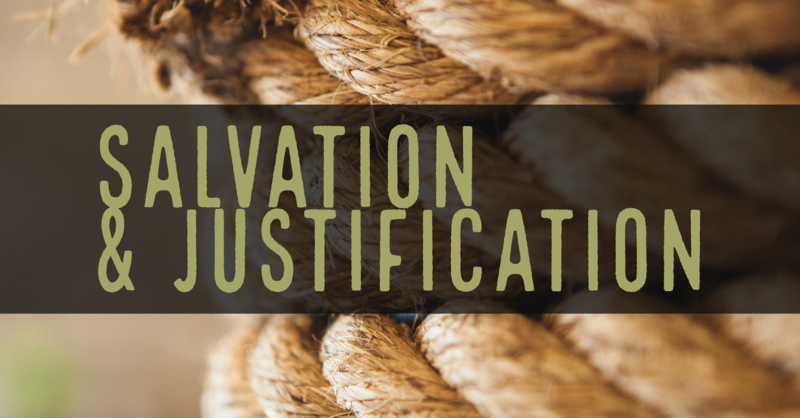 Justification is “the act of making someone right with God”. Remember how we are yucky, sin-filled people so full of gunk that we can’t actually be with God? That makes it literally, physically impossible for us to be with God unless we are made completely clean, which is impossible! you cannot be “justified” on your own before a Holy God! 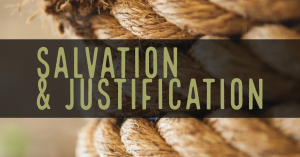 Is there any other way to achieve Salvation and Justification? All of this leads to one very hard question. Is there any other way to be with God besides Jesus? Can we be justified by any other means? Don’t all “religious roads” lead to eternity with God? The world is filled with many good people. I’ve watched just as many videos of humans saving puppies and helping little ladies cross the street as the next guy. But for all of the good humanity does, there will always be sin. We are infected with this disease and we simply do not have the ability to heal ourselves. We can never ever DO enough good to earn our way to heaven. Guys, He isn’t sending anyone anywhere. We deserve to go to hell. When we choose to sin, we choose separation from God. It’s God who chose to save us! He offers to rescue us! A loving God is SAVING His precious children from hell! But we can only be saved if we choose to be saved; if we accept the free gift of salvation and allow Jesus to justify us before the righteous God. Yes, hallelujah, Jesus is the ONLY WAY to be saved! Friends, some of you have already experienced redemption and claimed salvation and some of you haven’t. Some of you believe that Jesus is God’s Son, and you’ll tell people you go to church or are part of a small group. BUT you have never actually claimed the salvation that God is giving you. You have never admitted that you are a terrible sinner who NEEDS Jesus. If you are ready to admit that you need salvation, then tell Him! Tell God right now! If you still have some questions, please feel free to email us! We want to pray with you! 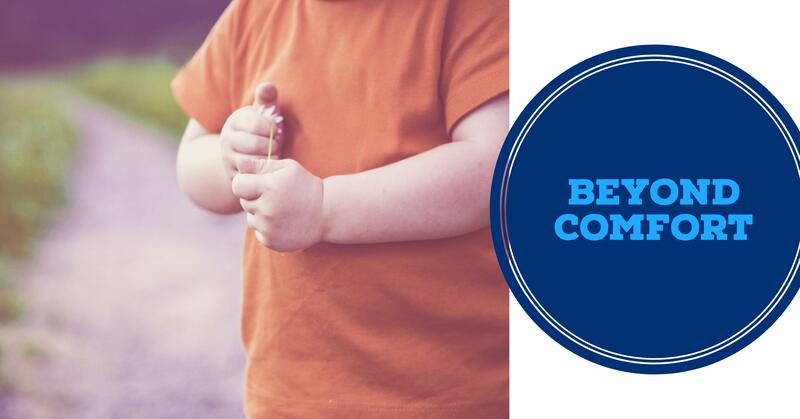 Have you joined our new Facebook community group?! Check it out! There are moments distinctly marked because they shape and direct who you become. Then there are moments, hidden and minuscule, that they can almost be forgotten, but they create your path just as much as those grand moments. When I was a young teenager reading about millions of Chinese people who didn’t know Christ, a marker went up in my heart and my mind. It shifted the direction of my heart. Another defining moment was when I surrendered to the call to missions when I was 18. The revival was special, and I can still remember the sweet hymns of praise we sang that night, because the call is what defined me. The Lord’s tender voice told me that England wouldn’t be home forever. There was another marker, another shift of my heart. But the minuscule moments come quietly and sometimes they are longer than a moment. Sometimes they are several months or several years. Working as a parlor maid for four years never felt grand or special, but I can see now that it shaped me and helped me learn how to serve with an understanding of hospitality. Attending missionary school was supposed to be a grand moment, but it turned into months of little lessons before something grand happened. I wasn’t allowed to become a missionary in China. I can hear his voice still, “Miss Aylward, we have no doubt the Lord has called you to serve, but it wasn’t to China, you’ll never be able to learn the language.” That moment gave me determination, fanning the fire in my belly. I knew I was called to China. I am quite the sight right now, a young English woman traveling on a mule through Chinese mountains. If I had been told two years ago that this is where I would be, I would have guffawed. Yet, here I am. I should arrive in Yangchen in just a few hours, where I will meet Mrs. Lawson, the missionary I will study under. Together we will share the gospel with all who will listen in this small Chinese village. I’ve waited twelve years for this moment! Many times I knew what it must have felt like to be an Israelite waiting in the desert those 40 years. Or even how Sarah and Abraham felt, waiting on the Lord’s promise of abundant generations when they had no children of their own. I had the Lord’s promise. I had His calling. I had His great love and my small faith. That was all. In waiting, the Lord grew my patience. He knew I’d need it for this journey to China, as it has taken many more weeks than I’d planned. In waiting, the Lord grew my knowledge. While the China Inland Missionary Center told me I wasn’t good enough or a fast enough learner, God placed me as a parlor maid in a home with a marvelous library where I could read as many books as I wanted. In waiting, the Lord grew my patience. It hasn’t been easy, and many days I wondered if this day would ever come, or if the Lord even spoke to me at all. But here I am. I waited on the Lord. Jesus Himself waited nearly 30 years before His work began. He may have felt ready, but God knew others weren’t. I supposed while God was working on my heart, He was also working in the souls of the Chinese people I will meet soon. I think I see it! That must be the village up ahead! I wish I understood more of what that man was saying, but he must be showing me where Mrs. Lawson is. Just over that little hill? And this – this is another marker. A defining moment. My first glimpse of my new home! Gladys Aylward lived from 1902 to 1970. At the age of 18, she was called to be a missionary to a place she had been drawn to for years…China. However, Gladys didn’t move to China until she was around 30. She heard of Jennie Lawson, a missionary in her 70’s, and found a way to get there. Gladys spent months saving money for a train ticket from England to China and eventually reached hundreds of people for Jesus! She opened an inn with Mrs. Lawson, and together they shared the gospel in story-like form every night. These travelers would share the stories with their friends, which spread the gospel all around! One of Gladys’ most known legacies is walking across China with over one hundred orphans that she cared for while Japan invaded China and offered a reward for Gladys – dead or alive. After 27 days in treacherous conditions, Gladys and the children boarded one of the last trains to freedom. Upon arrival, she was incredibly ill and fell into a coma for several weeks. She eventually moved back to England for a few years, but knew that she was needed in China and served there for the last ten years of her life. Gladys’ life was marked with incredible faith and heroism, but it didn’t come suddenly. Don’t miss the first part of her life. Gladys waited twelve years before she coming to China! I can only imagine the frustration, antsiness, anticipation, and longing that occurred while she waited on the Lord. Let this season of waiting be a marker in your life by drawing closer to the Lord and letting Him grow you during this season. 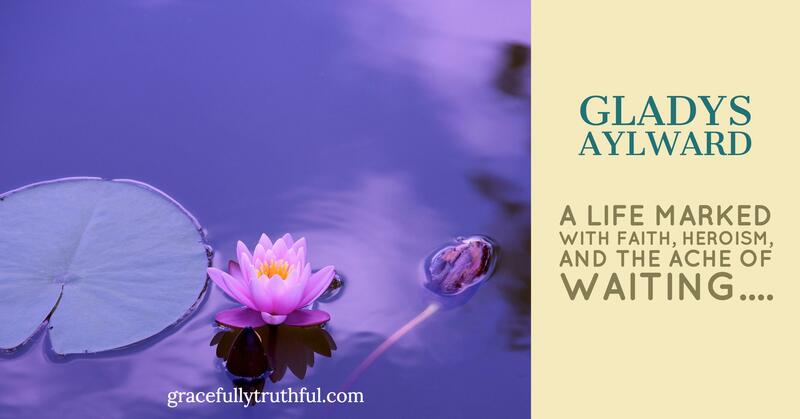 Curious about Gladys Aylward? click here. Thanks for joining us today as we journeyed into Sketched II Week Three! Sweat drips down my brow as I hit the wheat upon the rock, trying to release as much grain as possible to gather and hide. I breathe upwards trying to blow my hair from my face and cool my forehead at the same time. The work is exhausting, but without it we will starve. For seven years we’ve lived like this. Hiding our food from Midianite control. Their oppression is rooted in ancient ancestral division. We are descendants of Isaac. They are descendants of Midian. Midian and his brothers hated Isaac because he was favored by Abraham, their father. That hatred has stewed and simmered for decades. When I look at these Midianites, all I see is deep, hot loathing for us. Midianites worship many gods, where we worship one – Yahweh. I’ve learned how He delivered our forefathers out of slavery in Egypt. I’ve learned how He killed the Egyptians as they tried to recapture their slaves. I’ve learned how He provided manna in the wilderness. He is a good Father. Yet we are oppressively controlled by these Midianites. We are constantly invaded. Our crops stolen, our livestock killed. I continue rhythmically beating the grain while glancing around for Midian spies. That’s when I spot him. A stranger, definitely, but not a Midianite, for his hair is white and his robe almost appears golden. He’s under a tree just up ahead. I keep working, but I’m watching him. “AH!” I’m startled. He is suddenly right in front of me. A tall man. A mighty warrior? I scoff inwardly. I’ve been called many things, but mighty warrior isn’t one of them.The Lord is with me? More scoffing. Half of me is genuinely curious. Who is this stranger? What does he know of Yahweh? The more I speak with him, the angrier I become. Why did Yahweh abandon us? Clearly he knows nothing about me. Not only am I my father’s youngest and smallest son, but we come from the weakest family. “How can you expect me to save Israel?” Indignation and frustration dripping from my words. And for a moment, I believe him. So much confidence. But I can’t be too sure. I’ll test him. Let’s make sure Yahweh really is here, that this really is His crazy command. I secretly hope he leaves, so I can forget I’ve ever had this conversation. At the same time, I wonder what freedom without fear of the Midianites would be like. I go, and for the next few hours, I kill and cook a young goat and prepare unleavened bread for this guest, wondering the entire time if he will still be there when I return. I walk back, carrying the meat in a basket and the soup from the meat in a pot. Sure enough, there he is, waiting for me under the tree. “Here, sir!” I say to him. Really? I just prepared this entire meal for you! I spent hours and killed one of our goats and I’m about to pour it onto a rock? Annoyed, but respecting my guest, I do it. The man reaches out his staff and touches my offering. Faster than I can process, a fire arises, engulfing the food. A moment later, the food and the man have completely vanished. 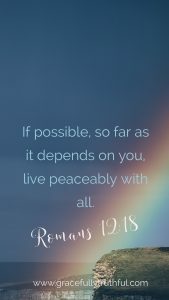 “Have peace. Do not be afraid. You will not die” I hear Yahweh say. I know His voice. I know it is Him. He is here. Right now in this unexpected, holy moment. Yahweh never abandoned us. With His help, I will deliver Israel from Midian. Right there, I build Yahweh an altar. 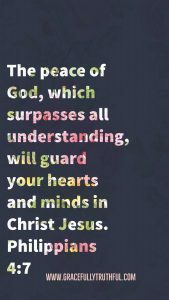 “The Lord is Peace”. 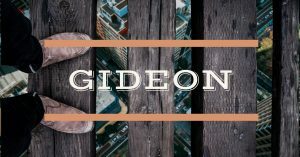 Rescuing the Israelites from the Midianites was just one of the many things Gideon would do for the Lord. He would also continue to test Yahweh. He struggled with doubt and whether the Lord was really asking Him to do the incredible. Sometimes, we hear the Lord’s voice as a quiet whisper. So quiet, we wonder if it is really Him. Sometimes, we hear Him almost audibly, as His voice presses firmly on our hearts. And sometimes, He uses a messenger to confirm what He’s been whispering. A pastor, a friend, or even a stranger in a grocery store. As I’m writing, the Lord is speaking to me! I’ve continued to “test” Him. “If you really want me to do this, God, then speak a little louder. Have someone else tell me. Friend, let’s agree together to not keep testing God when He speaks. He is here. He is speaking. He’s never abandoned us. Whether my husband whispers to me, sends me a text, or calls out from upstairs, it’s still my husband’s voice. I wouldn’t keep asking him to tell me what he wants in a different way. Stop doubting. Start listening. 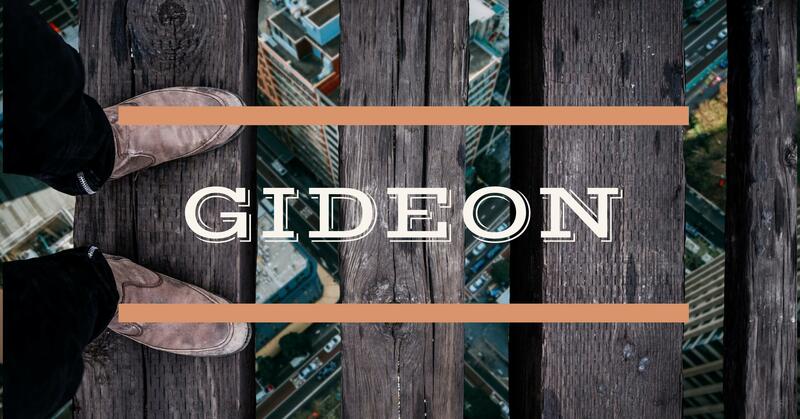 He’s speaking to you today, just as he spoke to Gideon. He is with you, valiant warrior, and He wants to bring you peace! Thanks for joining us today as we journeyed into Sketched II Week Two! Don’t miss out on the discussion below – we’d love to hear your thoughts! Here’s a link to all past studies in Sketched II! He had a long gray beard and wore tattered clothes and a backpack. I can’t tell you the first time I met him, but I know that he became a part of our story when my mom asked him to meet her at McDonalds so she could buy him a meal. After that, his name became a common word in our house. And then, Tony came to church with us. My dad brought Tony a tie and some clothes before we showed him to the bathroom of our tiny church to give him time to change and freshen up. The mixture of the Las Vegas heat, his thick beard, and wearing all of his belongings on his back made for a man with a distinct smell, and not necessarily a pleasant one. Tony walked into the bathroom and didn’t emerge for a long time. It may have been 15 minutes, but that is a long time for a little mind. When Tony opened that bathroom door, he still looked like himself, just a cleaner version that smelled a little nicer, too. But Tony was so proud. He walked taller, he held his head higher, and he was excited and honored to go to church with us. That day, Tony gave all that he could to the Lord. The only thing he could give was his appearance and his best effort to freshen up. He cleaned himself and clothed himself because he was going to meet with God, and he was going to bring God his very best. Tony reminds me of the widow in the 21st chapter of Luke. Another woman approached the box, not haughty as the one before her, although she also brought an offering that equaled quite a large sum. She was excited to give, and didn’t do so out of obligation or pride, but she gave knowing that she still had money left over to purchase food from the market for her family’s dinner that night. Then a third woman came, as Jesus continued to watch. She approached the offering box without a bag in her hand, but her fist clenched tightly. Jesus knew her, because He knows us all, and He knew that she was a widow, among the poorest of people. This woman had no husband to provide for her. He continued to watch as she drew her arm up and dipped her hand into the box, silently releasing what she had held her in hand. Two copper coins. Combined, they didn’t even equal one penny. That is all she gave. But she gave all she had. Jesus saw the widow’s heart. He saw her courage. He saw her trust and her faith. He saw her longing to bring her Lord a gift, even if that gift seemed like nothing in comparison to the others around her. Tony, he had nothing, yet he still found something to give, and when he did, he gave everything. Jesus sees the things we often don’t see. From the outside, it might not have appeared like Tony gave anything. He still wasn’t dressed in the nicest of clothes. His beard was still scraggly and there was still dirt under his fingernails. If I didn’t know Tony, I never would have seen his gift. But Jesus saw. Because He sees every little thing. Giving everything we have doesn’t always mean giving money. It did for the widow, but for Tony it was giving his absolute best to his appearance as he went to worship God. It means giving when it’s scary by laying down our pride and trusting that God is going to provide, He is going to care for us, He is going to see, and He is going to love us no matter what. Sometimes it means giving up your comfort and everything you’ve ever known to live on the mission field (Like this family! ), and sometimes it means giving the last $20 in your bank account to someone even though you aren’t sure why, and sometimes it means giving a homeless man your nicest tie and a delicious meal, when you can’t even afford to take out your own family. Give with everything you have. Maybe you noticed our hashtag on today’s image. 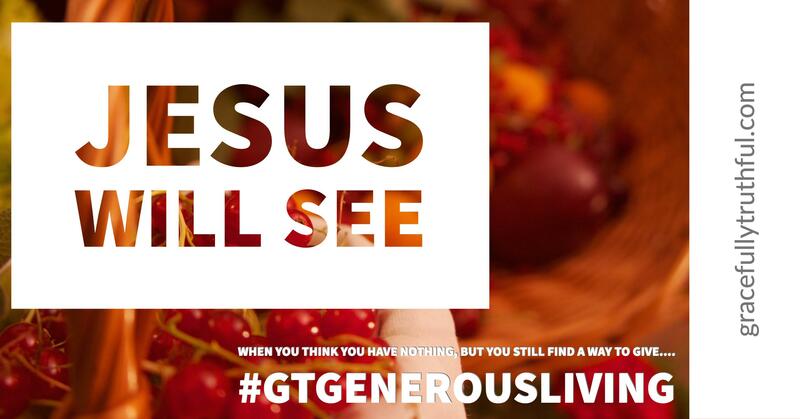 #GTgenerousliving Being generous is tough, but we want to encourage each other to live generously. Go to our Inst feed (@gracefully_truthful) or FB page and tag a friend who you have found to be generous. 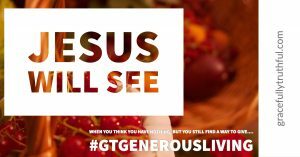 Tag them and use the hashtag #GTgenerousliving Let’s brag on how Jesus is changing us and encourage one another in the process! Thanks for joining us today as we journeyed into Borders Week Three! Don’t miss out on the discussion below – we’d love to hear your thoughts! The image of Jesus with children surrounding Him is pictured on the cover of children’s Bibles and displayed in Sunday School rooms all over the country. You’re probably imagining a specific version of this picture as you read. I am, too. 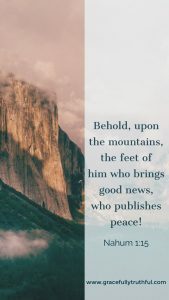 Jesus is in His white gown with a red sash, a light brown beard and sandals drawn on His feet. One child sits on His lap while His other arm is spread wide, welcoming the other children around Him. This image has almost become a cliche. I can imagine this scene so well, because I’ve been imagining it for over 20 years. But, listen with me to hear Jesus’ tone. Reread it for a third time, this time remembering how you felt as a child. See, when Jesus said, “Let the children come to me”, He wanted His disciples and the parents to know that He not only didn’t mind the children coming, He wanted them to come! He wanted them to hear Him and learn about His Father. He wanted them to climb up on His lap as He continued doing His Father’s work. He wanted to bless them with gifts and precious memories. These children were desperately wanted. All children are desperately wanted by our Jesus! But friends, not all children know just how wanted they are by the Savior. Maybe they know their parents want them, but they don’t know Jesus does. Or maybe they feel unwanted by so many, not realizing that Someone does want them to know Him and love Him and know they are loved by Him. They sit next to your daughter in class. They play on your son’s baseball team. They stand in front of you at the grocery store. They go to church with you. They walk miles to and from school every day in the heat of the African sun. They care for their younger siblings while their parents farm in fields. They ride on boats across treacherous waters to find safety. They are used to fight in wars. They are used for addictions and to cater to disgusting desires. They are sold and exploited. They are brought to America with their families. They are mutilated and married off to men as old as their fathers. They cover their entire bodies, and they wear nothing at all. They eat until their bellies can’t fit anymore, and they eat mud cakes to quiet their aching tummies. They sing songs loudly and learn chants, and they are sworn and scared into silence. They come from wealthy families, and they come from the poorest of the poor. These children live in America and they live in New Zealand and every country in between. Jesus took the children before Him into His arms, and blessed them. He gave them favor and protection. He took them into His arms, those same arms that would be spread out on a cross with nails driven into them, and He held these precious children. Because He wanted them. 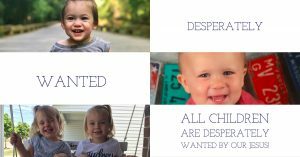 But Jesus also wants you to want these children. He wants you to love them and serve them and bless them. the weak, the poor, the vulnerable, and the lowest in the caste system. Start praying about what wanting these children means for you. It can mean deciding to work with children in foster care. It can mean sponsoring a child overseas. Maybe it means teaching Sunday School or even volunteering in your kids’ classrooms. It could mean a mission trip. It could even mean stepping outside of your political stance or your immediate emotions to give in capacities you never imagined giving. And then teach them about the One who wants them more than He wanted His own life. Thanks for joining us today as we journeyed into Borders Week Two! 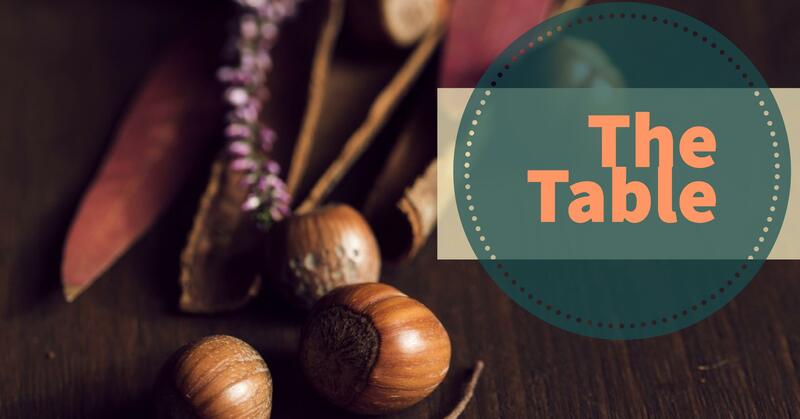 Don’t miss out on the discussion below – we’d love to hear your thoughts!